The BBC has revealed today (July 21) this year’s most watched Glastonbury Festival performances on iPlayer. 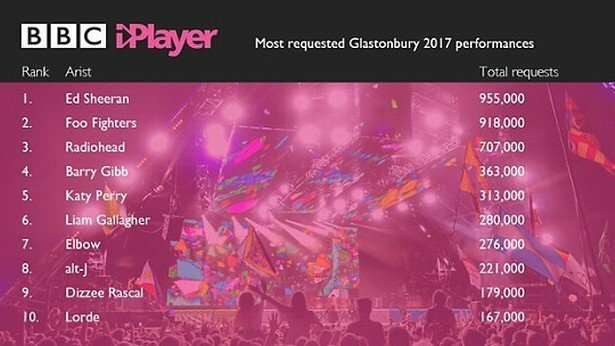 June has been a massive month for live viewing on the BBC iPlayer, with big events such as the general election, the Glastonbury festival and the One Love Manchester benefit concert. 21 per cent of the requests to BBC iPlayer in June were for live TV viewing, which is the highest level for any month since the Olympics in August last year. Coming in at first place is this year’s Sunday Pyramid Stage headliner Ed Sheeran, with 955,000 plays on iPlayer. Not far behind are fellow main stage headliners Foo Fighters and Radiohead, who have been watched 918,000, and 707,000 times respectively. Featured in 4th place is the Sunday afternoon performance by the Bee Gees’ legendary Barry Gibb with a 363,000 viewing figure, while Katy Perry crowd-surfes her way to the 5th place with 313,000. Liam Gallagher, Elbow, alt-J, Dizzee Rascal and Lorde have all also made top ten list, with all five gaining more than 160,000 plays. The BBC iPlayer offers viewers the opportunity to watch hundreds of Glasto performances on demand. All performances are available to watch for 30 days following their original upload date, after which time they will be deleted. This means there are only four days left before most of the Glastonbury performances on the iPlayer will be deleted.